A mixture of borax and ammonium chloride is used as a flux when welding iron and steel. It lowers the melting point of the unwanted iron oxide (scale), allowing it to run off. Borax is also used mixed with water as a flux when soldering jewelry metals such as gold or silver. It allows the molten solder to flow evenly over the joint in question. 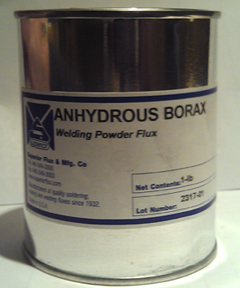 Borax is also a good flux for 'pre-tinning' tungsten with zinc - making the tungsten soft-solderable.